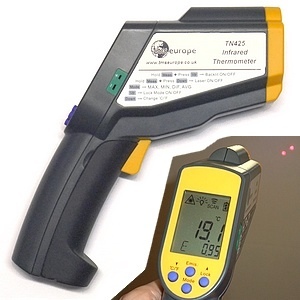 The TN425 is a non-contact digital infrared thermometer, it is designed for mid to high temperature measurement without the need to touch the surface being measured. It features dual laser dot to aid sighting, an LED light, a socket to measure a Type K thermocouple contact probe (ordered separately) and comes in a protective ABS carry case. The IR thermometer has a 50:1 optic ratio (target distance/diameter ratio), this enables users to measure small targets from a distance. The user stands a safe and comfortable distance from the target, points the thermometer at the surface to be measured, presses the button and instantly reads the temperature. Ideal for measuring the temperature of ceiling vents and hot pipes in the HVAC industry or any other item that is difficult to reach. This enables the user to measure most surfaces accurately and quickly. Each unit incorporates a clear, easy to read, backlit custom LCD display that indicates both the temperature and the emissivity. The thermometer features a four-button keypad, allowing the user to select the mode required, i.e. max, min, differential and average temperatures, view the max/min high and low alarms and adjust the emissivity from 0.1 to 1.0 in 0.01 increments (default set at 0.95). It has an auto power off facility that turns the instrument off after 60 seconds, maximising battery life. This function can be disabled, if required. The LED light and sighting laser can be disabled. It has a thread in the base for mounting on a tripod.